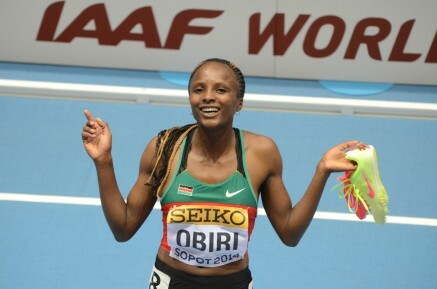 4th February 2017 – A Kenyan indoor 3000m record for Hellen Obiri (KEN) was the highlight of several strong performances from PACE athletes in the latest rounds of the IAAF World Indoor Tour. At the third round in Karlsruhe, Hellen ran toe to toe with British athlete Laura Muir until just falling back in the final 80m. Her disappointment of finishing second was soon overcome when learning she had set new Kenyan record figures of 8:29.46. Also in Karlsruhe Dina Asher-Smith (GBR) equalled the world leading time of 7.13 seconds in the heats of the 60 metres, then was only marginally slower when taking second place in the final in 7.15 seconds. Vincent Kibet (KEN) and Bethwel Birgen (KEN) were just edged out in a exceptionally close finish in the mens 1500m where just 0.2 seconds covered the top four! Vincent was third in 3.38.71 and Bethwel fourth in 3.38.73. Tom Lancashire (GBR) was only a couple of strides back as he took seventh in 3:39.96, an indoor PB for him. This followed Bethwel’s second place finish at the second round of the tour in Dusseldorf three days earlier. Here he was marginally quicker in 3:37.81. Joining him in Dusseldorf was Bralon Taplin (GRN) who opened his indoor campaign with a comfortable victory in his 400m race timing 46.25 seconds. When the times from both 400m races were put together this placed him second overall. The athletes will be looking to go faster as the final two rounds of the tour take place in Torun and Birmingham over the next two weeks.